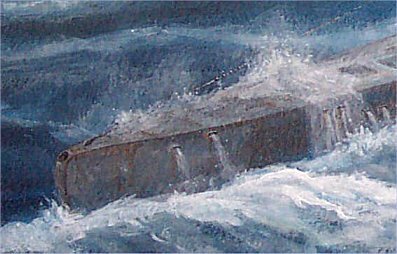 Original picture is acrylic on paper measuring 16.5" x 10"
In 1986 a Danish diver, Aage Jensen, discovered the wreck of a U-boat at 67 metres lying on the seabed roughly half way between Denmark and Sweden, near the small island of Anholt. Further investigations proved this to be U534 a type IXC-40 WW2 U-boat. U534 was commissioned into the German Navy in December 1942. Most of her wartime days were spent as a training boat in the Baltic Sea. Then in May 1944 she undertook weather-reporting duties south of Greenland � accurate weather forecasting could give an important edge over the enemy. On completing this patrol she put into the U-boat pens in Bordeaux, France in August 1944. However, by this stage of the war it was obvious that Bordeaux would not remain safe for long. U534 was quickly fitted with the new �schnorkel� equipment and sent on her way within a fortnight of docking. On leaving Bordeaux U534 was attacked by a Wellington bomber of 172 Squadron which she managed to shoot down using her deck guns. Much to the disappointment of her commander, Herbert Nollau, this was to be the only sinking U534 scored during the war. U534 spent the rest of the war in Flensburg and Kiel in Germany, until on 3rd May 1945 approaching Allied Forces made it necessary to flee her homeland. She was the last U-boat to leave Germany. She headed northwards together with 3 Type XXI U-boats when on 5th May they were given the order to surrender. Nollau, who at 26 was the oldest man onboard, decided he and the rest of his 51 crew were not going to surrender and they continued onward with brave determination. The Type XXIs also continued on their way. Three Liberators from 86 Squadron were immediately dispatched from Tain, Scotland to intercept the errant U-boats. On finding their prey Liberator G for George targeted the surfaced U534 with depth charges. The bombardier, Neville Baker, during the second low level attack ruptured the U-boat�s hull allowing seawater to pour in. Realising his boat was doomed Nollau gave the order to abandon her. Forty-nine out of the 52 crew survived and were later picked up by German ships and taken as POWs. Nollau was amongst the survivors but tragically he committed suicide a couple of years later. The 3 type XXIs were quicker boats and they successfully crept away to Norway where later they too were captured. On discovering the wreck over 40 years later, rumours began circulating that as U534 had been the last U-boat to leave Germany she possibly had Nazi leaders secretly hidden onboard. At very least the boat was surely loaded up with gold or other precious cargo. 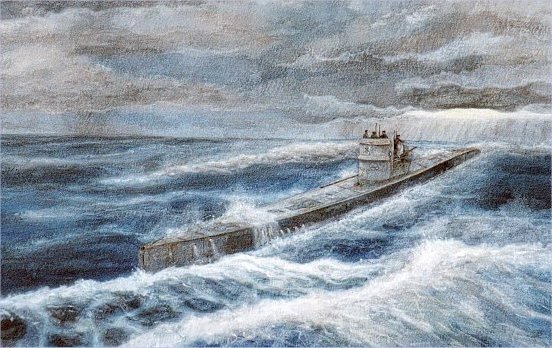 A wealthy Danish publisher, Karsten Ree, decided to get involved with U534 and he mounted a project to raise the U-boat from the ocean depths. The prints are signed by the artist and have the title of the painting "U534 - Atlantic Hunt" printed underneath the image. Years of diplomatic wrangling, fund raising and technical planning followed. Finally all was in place and in August 1993 U534 surfaced once more. Eight surviving U534 crewmembers and 4 men from the Liberator G for George were on hand to witness this spectacular recovery. Before a thorough investigation of the vessel could be carried out it was necessary to insure that the 50- year old ammunition was made safe. Thirteen torpedoes and 450 rounds of anti-aircraft ammunition were safely evacuated and blown up while three T11 Zaukonig torpedoes were taken away and stabilized. Careful inspection of U534�s wet and muddy interior revealed many an exciting find � uniforms, documents, personal belongings, even wine � but no gold or any hint of secret passengers. Since May 1996 U534 has been in a museum in Birkenhead, UK. Although rather battered and rusty after nearly half a century underwater, the public can explore both inside and outside of this extraordinary piece of history.